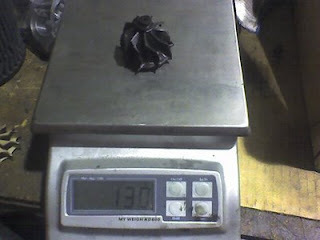 I found these pictures I took a while ago of the weight of a stock nearly undamaged GT-R exhaust wheel that broke off and a HKS 2530 exhaust wheel with some damage. 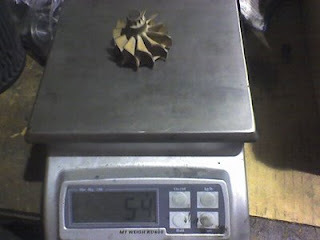 The ceramic exhaust wheel weighs in at 54 grams. The metal exhaust wheel weighs in at 130 grams. The 2530 wheel is larger, but its also damaged. Lighter is better, but the problem is that the attachment point of the ceramic exhaust wheel is just too weak. If you get some detonation you end up snapping the exhaust wheel off. Unfortunately its fairly common in the GT-R wheel.